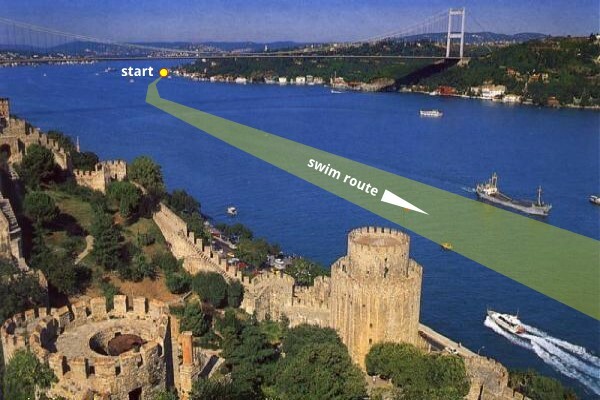 Funky Currents In The Bosphorus | Mediterra - Swim & Run Better Than Ever! 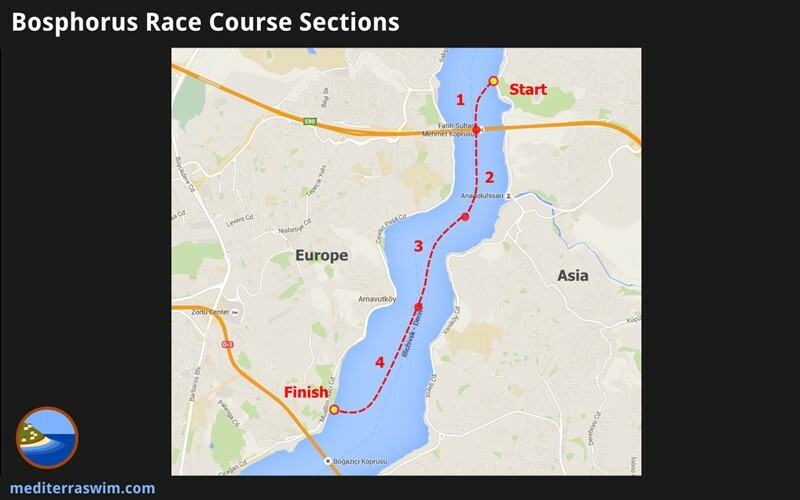 I am in Istanbul this weekend for the 2015 Bosphorus Cross-Continental Race. Previously, I wrote about the 2013 BCC race I participated in. This year we have several swimming friends and students converging from around the world – Netherlands, Russia, UK, South Africa to name a few of those we are meeting up with. Almost 1900 swimmers are registered to participate this year. Fortunately, they release the swimmers in waves, according to age group. Coach Baha and I have arranged a private 7-hour boat tour for Saturday (lunch included) to take a group of swimmers up the Bosphorus to get some real swimming experience in the peculiar currents of this waterway, teaching some techniques for swimming with, across, and against, as well as for navigation. We will tour the course, locating changes in current, pointing out the fastest route (theoretically) by using landmarks only experienced local swimmers know about in order to locate and stay within those favorable currents. We saw the need for this enhanced service to give swimmers a much better chance of not just finishing the race safely, but really enjoying it too. Of course, this is a race with measured times and awards and all, and some people will be consumed with going as fast as they can but really, this is a tour of Istanbul like no other and should be enjoyed from this unique and rarely accessed viewpoint. We encourage both mindsets. Though it is 6.5 kilometers by measurement, the currents make it potentially much faster… or much harder. Under the best conditions and on the best route, it is really more like a 3.0 km swim. It’s a tricky race, not because of the distance, but because of the challenge in finding and staying on that ideal route – a bad one can be really bad. A slower swimmer with a better (or luckier) route can easily pass up a faster swimmer on a poor one. I suspect that this may be one of the reasons why each year the famous swimmer invited as the promotional guest never actually swims in the race – it would be rather easy to get shown up! If anyone knows how to find that ideal route our friend Julie Upmeyer, an American artist living in Istanbul, would know how to do it – she’s taken first place in her age group a few times. After the swim two years ago I estimated I could make key improvements in my navigation on section #1 and #4. I intend to take a more aggressive angle at the start to aim for the middle of the bridge, to stay farther out in the middle of the channel and turn later at the final point, to sprint across the currents, avoiding the back-current that slows every conservative swimmer in the last 500m, while risking an overshoot of the finish (where I could be swept too far past to swim back and be picked up by the boat!). I am here to experiment and learn, not do the same old thing and get the same result. I might as well have some fun. We are watching the wind status. If a strong wind comes from the north (called Poyraz in Turkish), it will blow along with the southern surface current, keeping that section of the water relatively smooth, while stirring up lots of chop in the back-currents along the side. A strong wind from the south (called Meltem) could create really rough water in the fastest currents and making it tough on everyone. If prepared by training for these conditions it is just another swim day in wild water. But if not trained for such conditions it can be quite unpleasant, and possibly dangerous. I want to encourage swimmers to attend this race, but only after getting some previous open-water experience (with the distance and the waves) elsewhere. To be eligible for the race, foreign applicants just need to provide a swimming license or letter from their swim coach and a special report from their doctor. Meanwhile Turkish swimmers must post an acceptable time in an 800m test swim in the two months before the race. The race committee picks the top finishers in each age group to fill their quota – so getting a good time is important and it is getting more competitive each year. This elimination process forces people to train. That is a good thing, on one hand, because this is a fun but serious race that should not be entered casually. On the other hand, I am concerned because many of these swimmers are focused on preparing for 800m just to qualify while the race is 3000-4000m of actual swimming. 800m training in a pool is not necessarily sufficient for 3000m in open water. The conditions for swimming in open water like this are hardly close to the conditions one has while training in a pool. So Coach Baha and I have implemented a more substantial open water training program for our local swimmers to get ready for the actual race, not just the elimination swim. I will let you know what I observe in the race afterwards. If you will be considering this race in the future you are welcome to contact me about it and see what we have planned for swimmer support each year. I’m Suzy from Sydney Australia and I’m competing in this years Bosporus swim (2019). I’m in Istanbul for a week prior to the swim ( 13 – 20 July). Will you be running you 7 hour training day again for the 2019 swim, and if so does it fall within the time frame that I’m in Istanbul in the leadup to the swim? Also is there a 50 meter swimming pull that you recommend using for training purposes in Istanbul.